Explanation: The southern part of Orion, the famous constellation and mythical hunter, appears quite picturesque posing here over a famous volcano. Located in the Canary Islands off the northwest coast of Africa, the snow-peaked Teide is one of the largest volcanoes on Earth. Lights from a group planning to summit Teide before dawn are visible below the volcano's peak. 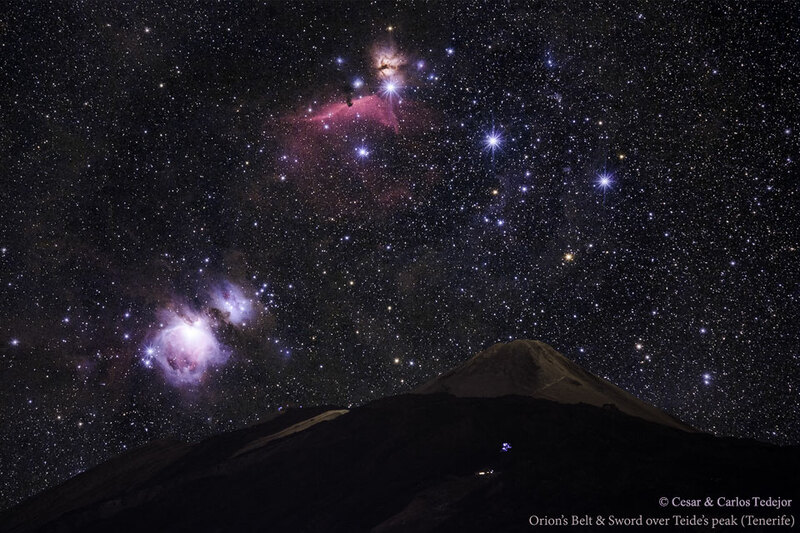 In this composite of exposures taken from the same location one night last month, the three iconic belt stars of Orion are seen just above the peak, while the famous Orion Nebula and the rest of Orion's sword are visible beyond the volcano's left slope. Also visible in the long duration sky image are the Horsehead Nebula, seen as a dark indentation on the red emission nebula to the belt's left, and the Flame Nebula, evident just above and to the right of the Horsehead.